Christmas comes but once a year, and once again it is coming up fast! Of course, it goes without saying that Christmas in the mountains is much better than Christmas at home. That was one of the reasons the whole ski holiday idea got started more than 150 years ago in St Moritz when a clever hotelier bet some departing summer visitors from London they’d enjoy spending Christmas there too more than back in grey, foggy London. He was proved right and the rest is history. Spending Christmas in a ski resort with your family is even more magical. Being able to promise your children a White Christmas, seeing Santa in the snow, is very special. And if you don’t actually like spending time with your extended family at Christmas, or indeed the whole Christmas prep and then making Christmas lunch, getting away from it all and them all is the perfect excuse. The problem is choosing where to go, and where to stay, from the myriad of choices. Do you put skiing first and look for a great resort or put Santa first and perhaps book a trip to his “homeland” in Lapland where you can visit him at home before he sets off on his Christmas Eve world tour? Do you choose a traditional, magical resort, or do you play it safe for snow (this is still early in the escape after all) and book a modern high-altitude destination where the chances of resort-level snow cover are that much higher? And do you invest in a hotel or chalet where someone will do all the leg work prepping Christmas lunch and doing the decorations for you or book an apartment and DIY Christmas, perhaps booking into a resort restaurant on the day if there’s space and if you can afford it? Although last Christmas was super snowy (and as a result, tour operators tell us, bookings have ski rocketed ), the previous three were not so much. Although some people will write “After last year’s snowy winter we’re expecting/hoping for the same again this winter”, and although there have been some big early snowfalls in October and November, no one REALLY knows how white this Christmas will be, as previous years, good or bad, have zero influence on this year, so it may be wise to hedge your bets and book high. Car-free and located 1,800m up in the French Alps, Avoriaz is one of the safer and (apart from all the partying skiers and boarders) peaceful resorts you can find. On 23 December they’ll be unveiling the tallest Christmas tree in the Alps at 23m high, bedecked with 22,000 LEDs – 3km of fairy lights. Christmas Eve promises to be even more amazing with a spectacular fireworks and light show, and this year the resort will be handing a Christmas bauble to every holidaymaker visiting the resort. That means over 10,000 presents to give away! Always with an eye on the environment the resort has also planted more than 464 Christmas tree saplings (two trees planted for every one cut down) – a spectacle in itself! Avoriaz also has a full Christmas programme of events including a big Christmas show and a Christmas sweets workshop where you can master the skills to create chocolate soup, homemade vanilla ice cream, chocolate spring rolls, coconut emulsion and chocolate soufflé, yum! Oh and a final Christmas treat – children under 12 ski free over Christmas week when an accompanying adult buys a pass (festive T&Cs apply). Europe’s highest town also has one of the most snow-sure resorts in the Alps, so it offers both traditional charm and altitude – a rare combination. What’s more, Christmas has an extra ski celebration dimension as the world’s first “modern” drag lift, a T-bar, opened here in Christmas 1934. Staying in Davos is extra special at Christmas. Along with the resort being fully decorated there are a number of Christmas markets, torchlit walks, traditional Christmas music concerts and family igloo building. Then on Christmas Eve “Samichlaus” and his Christmas angel will be at the children’s club at the Steigenberger Grandhotel Belvédère, where there’ll be Christmas games and fun for kids with cookie baking, Christmas carols and stories. If you like to go northerly in latitude rather than higher in altitude to make the chances of a snowy Christmas higher, then the leading Norwegian resort of Hemsedal has always been a nice choice for taking in the festivities. There’s a special Christmas Eve bonfire in the village the morning before the big day; a special serving of “Christmas porridge” at the children’s centre when Santa visits just before lunchtime, Christmas services at the church through the afternoon and a special Christmas Eve buffet dinner served at several of the local hotels and restaurants. One particularly nice touch, however, is that you are free to walk into the surrounding forest, though maybe not too far to be safe, and pick your own Christmas tree for your holiday accommodation, because, well, the forests here are made up of Christmas trees of all sizes. Banff is great to visit at any time of the year of course, a great resort with three world-class ski areas – Sunshine, Norquay and Lake Louise – all nearby. But at Christmas it takes it up a notch, no less so than at the world-famous Banff Springs Hotel. “They put on a huge ‘Christmas in the Castle’ celebration from 7 December to 1 January. Things like letter writing to Santa, snowflakes hidden around the castle for a scavenger hunt, A Christmas Carol show at their theatre, gingerbread house making, ornament painting, photos with Santa and the elves, Christmas pyjama party and more,” explains Naomi Harrison of specialist ski travel agency SNO (sno.co.uk), which has Christmas packages departing Heathrow on 22 December. Some ski resorts have a natural advantage over others when it comes to providing a magical Christmas as they’re located in particularly beautiful, atmospheric places where it’s that much easier to believe in Santa. Oh and they offer wonderful skiing too – and what could be a better Christmas present than that? Les Gets always goes that extra mile for families, with great attractions and services on and off the slopes, especially for younger children, all season long. It’s no surprise that some of the UK’s leading family ski specialist tour operators like Ski Famille have a big presence here. As you might expect, therefore, at the end of each year the village bubbles with excitement thanks to Father Christmas, who Les Gets lay claim to from 22 to 28 December, saying he lives in the resort. “Father Christmas feels at home here, but keeps to himself because he is so busy preparing all the Christmas gifts. He spends most of his time with his helpful, loyal friends, the elves, in the enchanted forest where he lives,” a senior manager at Les Gets tourist office explains. 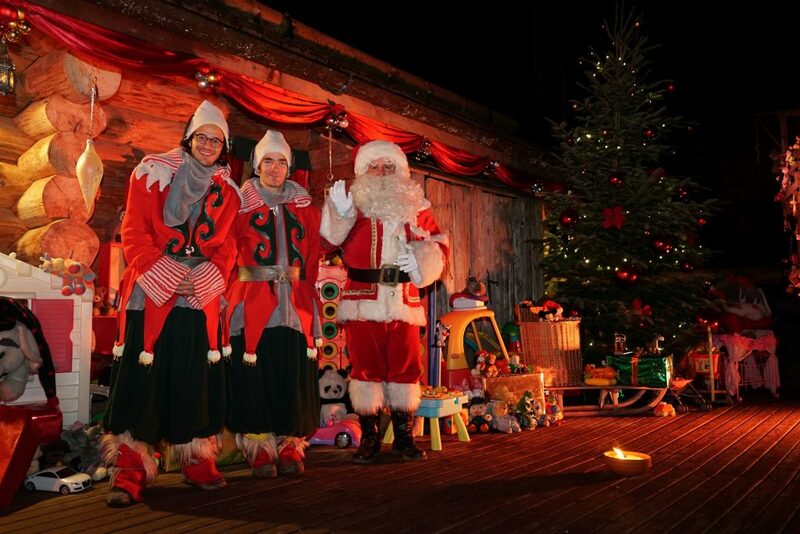 Included in the week’s programme are storytelling, visits to the heart of Santa’s magical, joyful land in Les Gets and numerous other activities and surprises for the whole family (workshops with the elves, Christmas market, shows, local village fêtes and fairs, fireworks and the arrival of Father Christmas on the 24 December … ). You get the picture. On Christmas Eve, the wonderful Italian resort of Courmayeur celebrates its very own Santa Claus, Rhémy de Noël. Kids from all over write to Rhémy, sending their letters or leaving them in a special post box located in the village’s Abbé Henry square, and miraculously every one receives an answer. The story goes that Rhémy de Noël was a chimney sweep who was born on Christmas Day. Surprised one year by a lack of snowfall in December, Rhémy embarked on a hike through the Mont Blanc glaciers to find out why snow had not yet fallen on the village on Christmas Eve. Once he reached the summit on Mont Blanc he discovered that all of the snow had been caught by a giant who was feeling lonely. Rhémy decided to spend some time with the giant, and finally snow started to fall upon Courmayeur once again. Since then, every year Rhémy has moved down to the valley on 24 December to bring presents to the children who light up a lantern to show him the way to the village. A small party is dedicated to his arrival at the Maserati Mountain Lounge, where, on Christmas Eve afternoon, all of the children wait for Rhémy, and, together, light the big lantern, a symbol of friendship and joy. The quaint villages on New England lit up by fairy lights are particularly magical at Christmas time, and thanks to the tendency of North Americans to borrow place names from all over the world to name their communities, it’s possible to stay in Bethlehem, the closest town to the historic Mount Washington Hotel and Bretton Woods ski area. You can even stay in one of the Inns there. The hotel itself runs the Holly Jolly Christmas Buffet with a festive celebration of sleigh rides, snowshoeing, skiing, stories with Santa, holiday treats and a bundle of other holiday-themed activities. A major Christmas buffet is also on offer (this is America!). 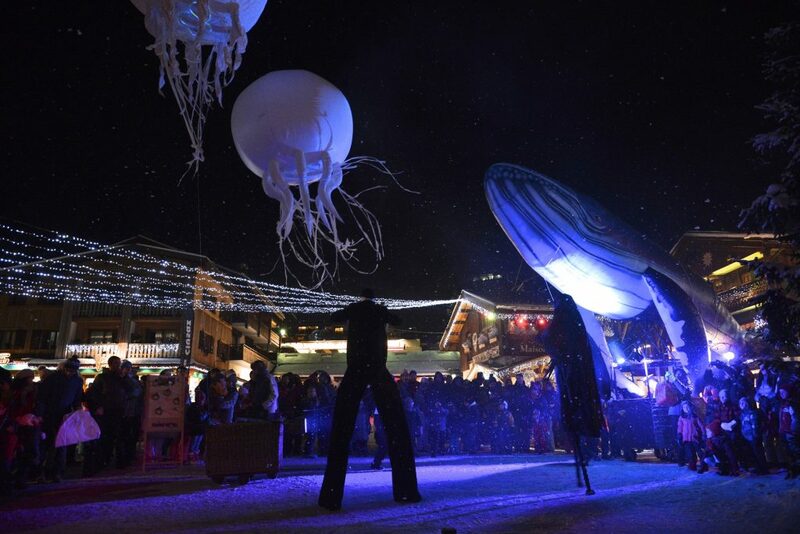 La Clusaz has been organising the famous Christmas “Pestacles” for nearly 20 years, the biggest family street theatre festival organised in the Alps each winter. 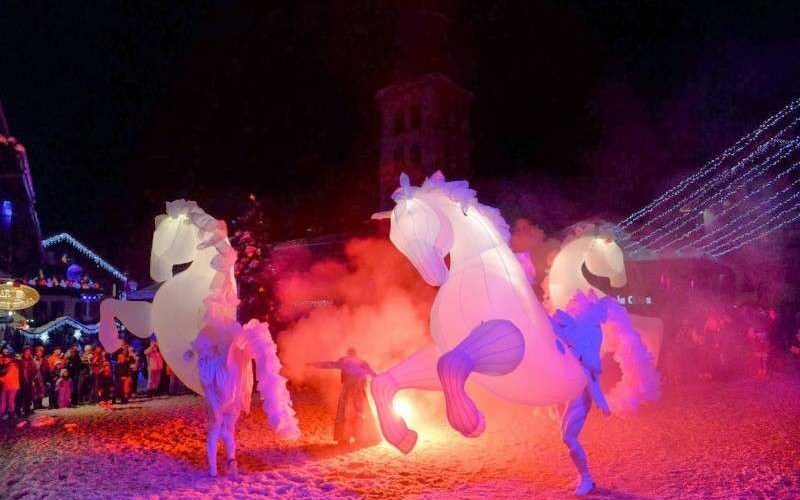 From 24 December to 2 January, people of all ages gather in the village for a magical and wonderful celebration of Christmas with a difference, totally unique in France and free for all. Children will marvel at street theatre in all its forms with artists from around Europe using the festive season to put on circus and theatrical shows. During the week, magicians, puppeteers, storytellers, jugglers, singers, musicians, artists and dancers put on spectacular shows for all the family. 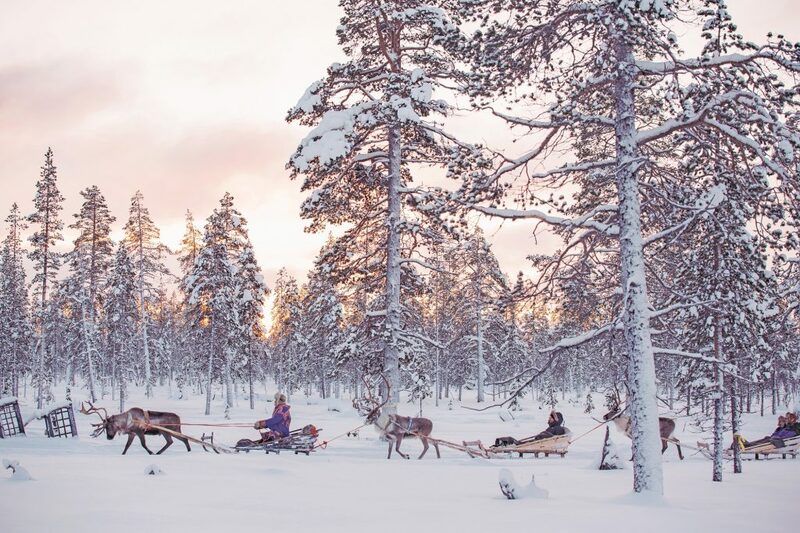 For a really special Christmas ski holiday it’s hard to beat a trip to Santa’s official homeland: Lapland. It’s a truly magical place and the good news for skiers is that the vast majority of visitors aren’t actually bothered about skiing, which means that in mid-December you’re likely to have the ski slopes pretty much to yourself, as not many Finns venture north at that time of year either. The possibly less good news is that there’s near 24-hour darkness that far north in mid-winter and it can be jolly cold too, but for Christmas lovers that just adds to the magic of the place, illuminated by twinkling lights with the ski slopes themselves floodlit, and often an ultra-fine powdery snow falling, and hopefully, once that stops, the Northern Lights dancing in the sky. 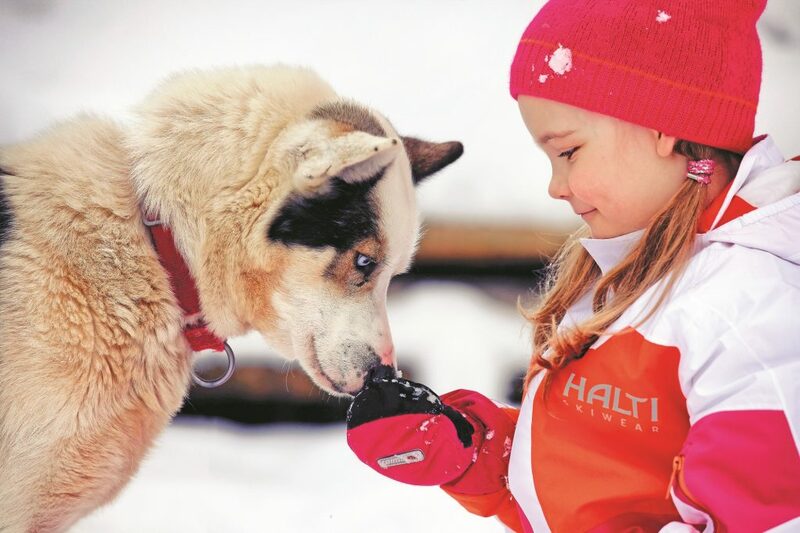 Both of the UK’s two largest ski holiday companies, Crystal and Inghams, along with a number of other specialist travel companies, are active in the area and can offer holidays to all of Finland’s leading resorts between them, where you can ski but also try out great activities like dog sledding or a reindeer safari and, all importantly, meet Santa. Santa actually has several different homes in the Finnish forest including his Secret Cottage near to the resorts of Ruka and Pyhä, where you can bake gingerbread cookies and sing songs with Santa for a particularly special experience, or his Secret Cabin closer to Levi and Ylläs, where you’ll be met by his elves and can even arrange for Santa to read the letters your children sent to him from home. Inghams are long-time experts in Finnish Lapland and say they’ve had to increase capacity there this winter due to demand. Popular options include their 4★ Ylläs Log Cabins, each of which have their own private sauna to relax in after a day of exploring, as well as a log fire and well-equipped, modern kitchen for cosy nights in. Ylläs is one of Finland’s leading ski resorts with one of its biggest ski areas and boasts one of its most appealing village bases. Krampus and Christmas in the Austrian Tirol!